In the late 1800s, Englishman Francis Barraud wound up a phonograph he’d inherited from his brother’s estate. His brother’s dog, Nipper, moved closer to the machine, cocked his head, and listened to the voice of his late master. The act inspired Barraud to paint the scene of the dog listening to the horn. Nipper was born in Bristol, England in 1884. There’s argument as to his specific breed – some say he was a Jack Russell Terrier or a Fox Terrier, while others claim he was an American Pit Bull Terrier. Nonetheless, Nipper went on to become one of the most famous advertising icons in history. Nipper, who got his name because he used to nip at the backs of people’s legs, passed in 1895. In 1899 Barraud tried to sell the painting he’d titled “His Master’s Voice” to cylinder phonograph companies, including the Edison Bell Company. With no takers, Barraud decided to replace the black horn in the painting with a brass one, and visited the Gramophone Company to borrow one. The company liked the painting, and offered to purchase it if Barraud replaced the phonograph with a Berliner disc gramophone. The portrait became a success, and continued to be used as an advertising image by the Gramophone Company, even after being purchased by The Victor Talking Machine Company. Victor, makers of the Victrola record player, used the image of the dog on millions of records and needle tins. In 1929, RCA Radio Corporation of America purchased Victor, and kept Nipper as its trademark image. In England and other countries overseas, the Gramophone Company stood on its own and eventually became known as HMV Group, plc. 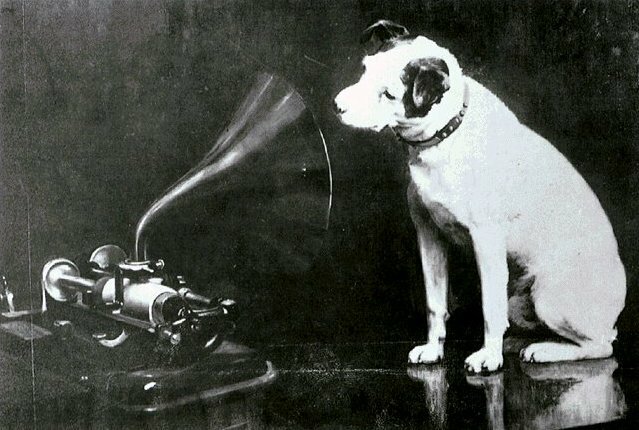 It has been said that HMV stands for “His Master’s Voice.” Nipper was used as the mascot. The original painting of Nipper. 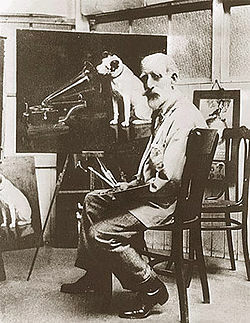 Barroud changed the phonograph to a Berlinger disc gramophone in order to sell the painting to the Gramophone Company. When Nipper died, he was buried in a small park surrounded by magnolia trees. A bank now occupies the site, but still pays tribute to the dog. Inside the entrance of the Lloyds TSB branch is a brass plaque commemorating Nipper. In 2010, a small road near Nipper’s resting place was named Nipper Alley. Across from the Prince’s Theatre in Bristol – where Nipper had lived with his original companion – there’s a model of Nipper above the doorway of a building. A four-ton Nipper sits atop the roof of the old RTA building on Broadway Street in Albany, New York. Another large Nipper used to grace the RCA Building in Baltimore, Maryland before it was moved to overlook Lee Highway in Merrifield, Virginia. The statue now sits atop the Maryland Historical Society building in Baltimore. The street leading to a development on the property in Virginia is named Nipper Way. Presently, the record companies that have used Nipper as their trademark image have fractured into different enterprises worldwide. 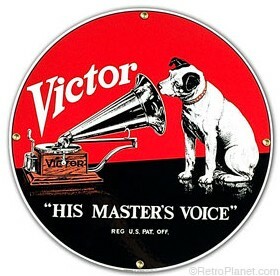 RCA and HMV both still use “His Master’s Voice” and Nipper as advertising mascots. RCA even has Nipper look-alike dogs used in commercials, print ads and on the company’s website. Nipper can sometimes be seen running with his “son”, Chipper.